A question we are often asked here at Forge is how do the MacAdam-Step binning regimes of Cree and Lumileds compare? This brief article makes the comparison. 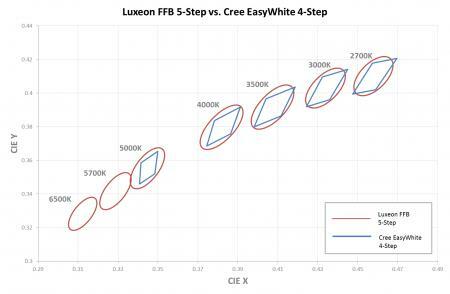 The most striking difference, and indeed likely the source of a lot of the questions, is that Cree use a series of quadrants to define their EasyWhite™ colour bins whereas Lumileds use a set of ellipses as part of the ‘Freedom from Binning’ regime. Plotting quadrants is relatively straightforward using a spreadsheet application; however plotting ellipses and indeed rotated ellipses is a little more involved. The outcome of plotting exercise is shown below for the various 3000K CCT bins. Which is best? Well it depends very much on your application and the cost constraints of the product. Narrower binning will always give better colour control and repeatability, but it will also involve an inevitable increase in cost.